Relentless. Vicious. Outstanding analytical mind. Always quietly brooding. Always looking, always taking in thousands and thousands of details. He doesn’t speak a lot. Is known as the quite one. But his eyes, oh his eyes will tell you there is a whole world to discover there. If he speaks, it is with a silver tongue. He is a charmer, knows how to make you laugh, how to grab and keep your attention. If you want something, he will find a way to get it to you. You’d be a wise man to keep in mind that nothing ever comes for free, though. Lucky for him there are not much wise men found at the ocean. In the end he is smart and cunning and always spinning his web in a way he has perfected over the years: quietly and with devotion. Knowing that the only thing he has to do is be patient: for the day will come that he will be the one collecting the debts he has created. Relentless. Vicious. Outstanding analytical mind. Always quietly brooding. Always looking, always taking in thousands and thousands of details. He doesn’t speak a lot. Is known as the quite one. But his eyes, oh his eyes will tell you there is a whole world to discover there. If he speaks, it is with a silver tongue. He is a charmer, knows how to make you laugh, how to grab and keep your attention. If you want something, he will find a way to get it to you. You’d be a wise man to keep in mind that nothing ever comes for free though. Not that there are much wise men found at the ocean. He is cruel, he knows how to hurt. How to lure someone in, to work them and to break them. He will go to any lengths to get what he is owned - and somehow the world always seems to own him a lot. He does not battle for attention or leadership. Nor does he need to: people are attracted to him, like moths to a flame. He is happy to follow any captain that commands him, not feeling the need to be the one entrusted with the fait of too many men on his shoulders himself. The ones that command him, though, should always be advised to take care: to appreciate him. He is the kind of person to leave burning bridges in his wake. Not that any is ever going to catch him with any kind of fire, but everybody always knows that it was him. It is the kind of man he is, the man he has become. The one that leaves pain and destruction behind him if he doesn’t get the respect that he feels he has earned. He likes hard work. Nothing that is worth something ever comes for free. He likes the way his body can hurt and his muscles can ache. He has a habit of pushing himself to the limit; past a breaking point of no return. Physical work keeps his mind from wandering to pleases he doesn’t want to go. It keeps it from the things he rather doesn’t see: when his hands bleed, at least his soul doesn’t have to. To the outside world he is always composed, always in control. Even though it doesn’t take a lot to anger him (and he is not one easy to forgive), his reaction is almost never straight away. He does not act upon his feelings; he does not make any rash decisions. He waits. He is exceptionally well at waiting. He can wait for hours, days, months - years even, if he has to, but at some point he will strike back - and you will never see it coming. You will realise he has been playing you the moment it is too late. When that smile, that angry, vicious smile, finally break through on his face and that perfect mask is gone. His enemies can live a long, long time, but Deimos knows: in the end, hell is always waiting - he is the one who is going to bring it to you. Despite the man he has become during his life on various pirate ships, Deimos also has a deep going strike of loyalty. Something he is carefully of showing, since loyalty is not highly valued on the ship. He is trained to be competitive, but it is something that rather bores him. He knows, out of experience with his mother, that it is almost too easy to overstep your boundaries and the price you have to pay for it, can be all too high. Besides, he does not like to play a game he cannot win, and what use is there in battling all those elder brothers he has? Instead he tries to provide them with the things they want and need. To keep them strong, to back them up, to be there to listen. In return, most of the time, they let him be. He has had multiple chances to betray them and use them, but he prefers to turn a blind eye and look the other way. As he sees it, he and his full-brothers are more part of the ship than all of the others: their mother, after all, was the only one to ever set foot on it’s decks, to be part of it’s life and it’s crew. Therefor his blood runs deeper than all of the others: it is woven through the wooden frame he walks on every day. A frame he refuses to paint, in any way or matter, with the blood of the ones that sail under it’s protection. In the end Deimos, smart, cunning Deimos, is always spinning his web in a way he has perfected over the years: quietly and with devotion. Knowing that the only thing he has to do is be patient: for the day will come that he will be the one collecting the debts he has created. He is not nice, but his loyalty makes him kind in a way. He is very, very good in causing pain, especially the emotional kind, but he is cautious in his ways. He is not physical violent person. He does not believing in breaking bones and bodies. When it comes to that kind of physical violence, he usually walks the other way. He has not a problem watching it, but it doesn’t really reach him. He has seen too much blood to still be able to make any sense of it. Besides, pain means to himself very little: being beaten up and shot down more times than he can count he can now simply turn his mind off. Breaking him through physical torture is not something that is going to happen. Ever. It is why he doesn’t believe in torturing others in the same way. It is the thing he leaves, happily, to his brothers. And he does what he always does: he waits. He waits till they run into someone they can’t break with their hands - and swords and knives - and then, after the waiting he will speak. He will say ‘let me work him’ and nine out of ten he succeeds where his brothers failed. It is his strength - his power. He doesn’t believe in blind muscle. He believes in tactics; mind games. He believes in the terrors you cannot see, but that will leave the mind unraveled and the soul broken. That is what he does best, that is the kind of monster he has become. Showing sadomasochistic tendencies when he is in love, Deimos is not one easy to deal with. Never been taught how to love properly or how to express his feelings all together, he most of the time ends up annoying the person he fancies. Despite being laid back in character, he can become rather pushy when he has set his mind on someone. He will do anything to gain that person’s attention, and preferably in such a way that angers them. Perhaps it is because strong emotions set him off: he is always longing for that rush of adrenaline. It is the the knife to his throat that turns him on. Rage and beatings will likely be greeted with kisses and smug smiles. During his life he has been hit so many times that he doesn’t care for pain anymore. He is just craving for attention, and he will do anything and everything to gain it. Providing services Deimos is a provider of, let’s say, services - services in the broadest sense of the word. They can be simple and pretty straight forward like delivering money, jewellery, cards, rum, bread or even women. Sometimes they are bit more complex, more specified, like bush viper’s venom, or a particular kind of gems or some kind of delivery service to some person on the other end of the ocean. But all of them are, either way, still pretty straight forward. You go to Deimos, Deimos gets you the goods or delivers your letters, or does whatever you have been asking. You wish it, he has it. Pretty straight forward indeed. His position, however, involves a bit more than providing regular services. Everyone knows that when there is unrest underneath the decks, Deimos is the one to turn to. When goods are stolen, and the young pirate is made aware, the stolen things have the tendency to reappear - and the issue quietly goes away. When the men are hungry, and the situation tends to get out of hand, Deimos sets his mind to food for the crew and somehow there is suddenly so much fish in the ocean that they basically jump on the decks, straight into the hands of the hungry sailors. When the men have been drinking, and start to fight and the situation is about to escalate, Deimos steps in and the tension fades away. The men return to their tables and the whole thing is forgotten before the morning comes. No matter what he requires, if it is food or drinks or gold or peace, Deimos doesn’t seem to need to do anything for it. He does not need to speak or trade or fight for it. He just puts his mind to it and he waits - he knows it will come to him. Simply put you could say he has a way of attracting the desired outcome: the universe pretty much slips into place for him. If you would ask any of the sailors they would just say Deimos, young quiet Deimos, is a provider of services. They will say it with a smirk, because they all know at least half of these services are the things no decent men would ever talk about in daylight. But that’s fine: Deimos's boyhood has been long time gone, and pirates are always sailing underneath the half-darkness of twilight anyway. As for Deimos himself, he knows that it is a bit more than luck, or good fate, that manages to throw all the right things in his lap - just at the right time. But, if anyone ever bothers to ask, he will shrug and smile and tell you he just got lucky. Fate is funny in a way, you see? Diffusing negative emotions Luring right underneath Deimos’s power of attraction of goods and services, there is another power, perhaps even more subtle than the first one. If people notice it in the first place they tend to write it down to his quiet and composed nature. Fact is however that Deimos has a calming effect when it comes to negative emotions. It works especially well on anger, but goes a long way with sadness and terror too. When he is around fights they calm down quickly; anger just flows away. From day to day he does not use this power a lot; it takes quite some energy to continuously keep the emotions of others in check. He has found out, however, that it is an useful tool to have around his hot-headed captain. Since even Timo notice he feels better when Deimos is around, he allows him to be there. Continuously being in the shadow of this feared captain has earned Deimos an ever further level of distinction - and he likes it that way. He rather has that people respect him out of fear than not respect him at all. Being one of the youngest among the crew, he knows he can use any shape and kind of respect - if it is not for his own skills, then at least for the ones he is close to. General appearance Deimos is not very tall, but what he lacks in height, he makes up in muscles. His life on the ship has hardened his body in the same way as it hardened his mind: he is tanned and covered in scars. 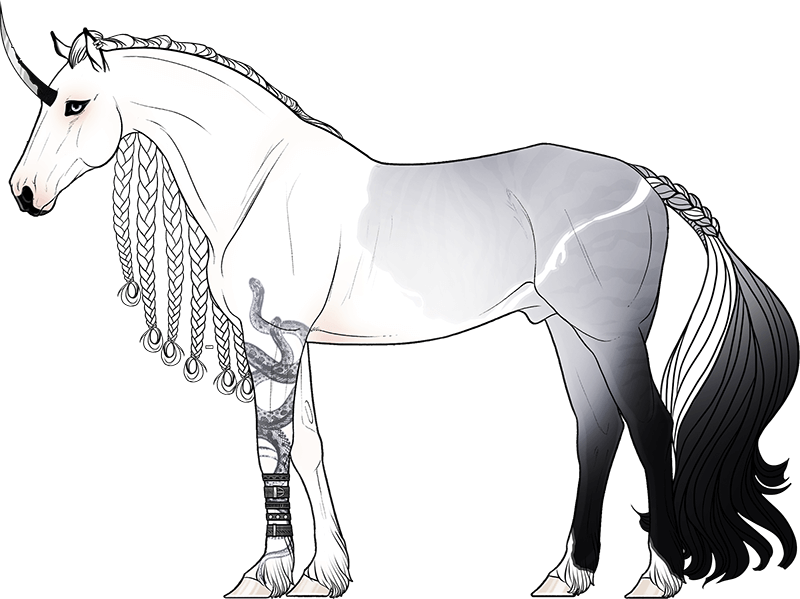 His hair is long, wild, light of colour and usually (partly) braided. His eyes are quite pale and form a sharp contrast with the rest of his appearance. When you are face to face with him, you will notice he has a very thin scar over the bridge of his nose till halfway his left cheek. Snake skin Has snake tattoos wrapped around his chest and shoulders; all around his arms to the tips of his fingers. When he moves, when his muscles roll underneath his skin, it is like they move. They are quite detailed with incredible thin lines. Colourless but with fine, shining eyes that seem to follow you wherever you go. There is a bit of glow in the dark ink in them, and they have a subtle glow about them when the darkness falls - it holds for a couple of hours, usually all fade away somewhere after midnight. Bracelets If there is something he wears a lot, you could say it are leather bracelets. Thick, thin, braided or straight: from day to day you can find at least a couple around both his wrists. They don’t hold a lot of sentimental value to him: he trades them off as easily as he gets them. Like with most pretty things he appreciates them for their beauty, but also recognises that is all they are: beautiful. So if they can get him something better, more useful or even prettier, he is not afraid to sell them. He also knows, but does not say, that the hearts of women are easily won with the leather pieces. If you can still taste the wine on your tongue and he is binding the straps around of one of his personal bracelets your wrist, his fingers touching your skin, be aware: you are not the first one to receive such a gift and you most certainly will not be the last. With most things in Deimos’s hands, even his jewellery turns out to be just a tool: it’s something to used, far more than to be appreciated. Born during an exceptional cold winter - or perhaps it was just in a very cold place. Either way there were hills of ice and there was storm in the air and there was snow on the decks. Somehow the sea did still move - the waves still roaring -, but all that movement was never enough to keep the ice away from it’s surface. Any men that would fall into those waters would be frozen to death long before they could drown. Of course Deimos does not remember this cold, but somehow he can still feel it, like it has been written into his bones. Perhaps it is why his eyes are deprived of every colour. Every colour, but that pale flicker of grey: because the storm of ice and snow he is born in has never truly left his body. Perhaps it is why he can hold his tongue so well, or can be unmoving like a statue while the world surrounding him is slowly going up in flames. The chance is fairly well that he has ice water running through his veins - instead of flaming hot blood. Just as Deimos taught himself to always get back up, he also taught himself not to weep and not to complain. From a very young age he stood up and he dealt - with whatever it was that life handed to him. If others told him to stand and to wait, he stood and he waited. However, when he was told to kneel down and beg for it, his cold eyes would only shine with contempt, but he would never move a muscle. Even back then Deimos bowed to no one. It would have gotten him into trouble, if it weren’t for the fact that the ones that asked him to bow were never the ones that he was obliged to bow to. Because of his quiet and composed nature he was never seen as a threat by any of his masters - thus they didn’t require him to bow. 0-1 y.o. Born as the youngest of five brothers on the Atlantis Maiden as son of Swartnenth and Acalanthe. He a cruel captain, she the only one of his mistresses to ever set foot on his ship. Eventually the same thing that attracted him to her in the first place is the same thing that got her killed in the end. She dies a few months after Deimos’s birth and he is left without no real memories of her. 12/13 y.o. Spent a year on a Caribbean island where they taught him to be a pearl hunter. Developed excellent diving and swimming skills before he returned to the Atlantis Maiden. 15/16 y.o. For most of his life Deimos has sailed underneath the flag of the Atlantis Maiden. Until Swarth left and Timo claimed the rule of the ship and changed her name to the Atlantis Scorn. To Deimos it is all the same: one unscrupulous captain or the other, it does not make a lot of a difference in the end. 18 y.o. Current time period. Deimos is working as mate on the Atlantis Scorn. Among the crew he earns a name as provider of things, now swiftly growing in power. He tends to keep close to his captain, both in the knowledge he can at least contain some of his captain rage, as well as the fact that Timo is the most powerful man on the ship. A man he rather regards to as his friend than his enemy. 19-21 y.o. the Scorn is overtaken by the Sinking Sun and set to fire. Timo is killed in the process. Unable to live with the loss of his captain, Deimos leaves both ships, and the other Dvoraks, behind. For some time he sails with smaller ships, finds shelter in various harbours, and starts building a reputation for himself. With his powers and history his name proceeds him soon. He is not one to thrive on the fear of other’s, but he has to recognise it feels good to have this kind of power. ♀ “I used to be this person, you know? I loved the ocean. I really, really loved her. You can’t even imagine. I was the best swimmer on the island - on all the islands in the region. And then he came along and I ended up dead. I cannot be that person anymore, because she died. I don’t know how to swim anymore. I remain very much afraid of the ocean, because I know - I know, he is somewhere out there. ♀ She is the desert sand, hot and dry and impossible to shake out. Everything is done in a rush, messily, without much thought, as if rushing to beat an unknown ultimatum. She is sharp too, her words the sort that don’t hurt straight away but will leave you lying awake in bed all night replaying them in your head. Royalty means very little to her, it is simply an obstacle in the way of her bid for greatness, a war against rules and regulations of which she is determined to win. The prodigal son of a tyrant on the seas, Timo was raised to be cruel, ruthless, ambitious, and most of all never to be a disappointment. He ousted his older brother as their father’s favourite and got rid of all competition in his pursuit to own the oceans. Through his scheming he even threatened his father into hiding, though the truth of his disappearance is kept secret. He strikes terror into hearts and enjoys it. ♂ Braegan Dimitrious Booth has a playful and cocky personality and a tendency to ignore authority, often using unorthodox methods which are met with disapproval by his colleagues. He is capable of amazing feats of observation and induction and although he says he isn't psychic, some people maintain that he must be. He is not afraid of taunting others, although after the death of his mother he is more cautious and knows that his actions can have terrible consequences. Although he generally exhibits a happy demeanour, he suffers enormous guilt. Dvorak Family Deimos has been created by alimarije as part of the Dvorak Family. If you would like to plot with me, you can either contact me directly on DeviantArt or on Chewing on Pearls. Cayenne She was the girl Deimos fell in love with. They spent an amazing couple of months on a beautiful island, until his brothers came back for him. It put a violent end to their relationship: she asked him to betray them, he killed her to repay her in kind. Elaphaea Despite the fact that is not particularly keen on ever falling in love again, even Deimos’ eye gets caught every now and then. With her sharp tongue and blazing personality, he can’t help but be intrigued by this dark-haired beauty. Of course he knows, with his rep-sheet, there is no way this is a thing that can end well. Yet being attracted by all that is meant to burn, he is trying to catch her attention either way. x Ela (AU) A first meeting somewhere in a harbor. And later: Deimos giving her snake jewellery of some kind. He likes snakes, in particular the venomous type with exotic colours. The bush viper is by far his favourite. He is known to keep a couple of them, and he is not afraid to use them against enemies. If you happen to find one of those reptiles in your bed one evening, you know who is holding a grudge against you. He loves greens and blues, drowns himself in the colours of a tropical ocean. Despite being born somewhere cold, he is always waiting for the ship to sail back to warmer waters, so he can enjoy the lovely weather - and the beautiful animals that belong to the tropical climate. He is an excellent swimmer and diver. During his early years he has spend one of his years on a Caribbean island and was trained there as a pearl hunter. If the Scorn is lying for anchor in a bay, you won’t find him in one of the bars or houses of pleasure. Instead, go search the beach and the ocean, it is likely you will find him somewhere half naked, nearly drowned and surprisingly happy. He is better with knives and daggers than he is with guns. Although he knows how to handle them, he finds them heavy and sluggish in use and not very reliable in general. Furthermore he has found out that a knife makes a better torture tool than any gun - and one way or another he is fool for the look of terror in his victim’s eyes. There's nothing weak about beauty, child. The only weakness in it is if you think it means anything important. The sweet-smelling aroma of the island spices still hung in the air. It filled his nostrils and titillated his appetite all over again. His appetite drove him mad for something much more than food.